Surprise! It’s another review of a Riordan book! Ah, good ‘ol Uncle Rick. Can you tell he’s my favorite YA author, right up there with Ally Carter? He just keeps coming out with all these new books. The best part? They bring back old characters from past series, and the readers get an update of their lives. It’s the ultimate fangirl dream. The second book in The Trials of Apollo series did not disappoint. 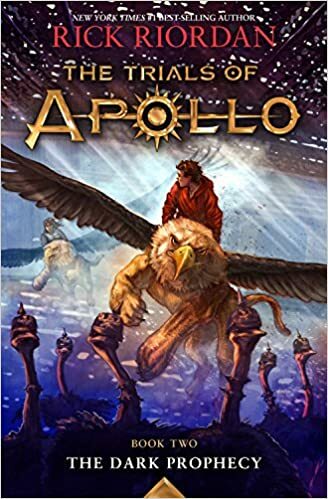 After reading the Percy Jackson series, Apollo quickly became one of my favorite Olympians. Then, Riordan went and started a whole series about how Zeus punished him by making him mortal (and unattractive), then forced him to undergo trials to regain his immortality. Great idea, Uncle Rick! The Dark Prophecy brings back some of the characters from Percy Jackson, and all the characters from the first Trials book. We get a whole book dedicated to my favorite god, plus Caleo! We also get a glimpse into the secret ways of Artemis’ hunters, and more mingling of Roman and Greek traditions. This book seemed much more fast-paced than the first Trials, which I am grateful for. After you read five or ten Riordan demigod books, you get used to the fast-paced quests the characters embark on. Uncle Rick manages to spread out all the events of less than a week, without making it feel like a millennium. Dark Prophecy was entertaining, and even had its unpredictable moments. While I can’t say I was completely blown away by this book, Uncle Rick met my expectations. Let’s just hope the next one isn’t so outlandish.